Heesen Yachts Delivers First Yacht in New 50 Metre Steel Class: Omaha! Heesen Yachts just announced they have delivered their new 50 metre steel class luxury yacht: Omaha. At 50 metres, Omaha has a Gross Tonnage just below the 500GT threshold. As a result, this displacement motor yacht is the first yacht in Heesen Yachts’ new 50-metre Steel Class which is the successor of our 47m Steel Class. After extensive sea trials, the luxury yacht has been proudly delivered to their owners. The trials were conducted in the North Sea. The weather was ideally favorable. Therefore the seas ranged from calm to moderate. Christined Omaha, the interior of the new YN 18350 yacht from Heesen Yachts was styled by Reymond Langton. The exterior by Clifford Denn Design. With a 50m displacement, Omaha has a range at 12 knots of 3,800 nautical miles. During her sea trials, Omaha did exceed the contractual speed, reaching 16 knots. This positive result proved to be extremely maneuverable in all conditions. This fact is due to her large rudders, in combination with the power steering unit. Omaha is powered by two MTU 8V4000 M63 engines. She has a range of 3,800 nautical miles at a cruising speed of 12 knots. YN 18350 is the first in Heesen Yacht’s newly designed 50 metre Steel Class. As previously mentioned, the exterior lines of this luxury yacht are by Clifford Denn. The company spliced the Heesen DNA with lines inspired by classic car design. It creates a true blue-water yacht, with a bold presence on the water. The end result is spectacular, to say the least. 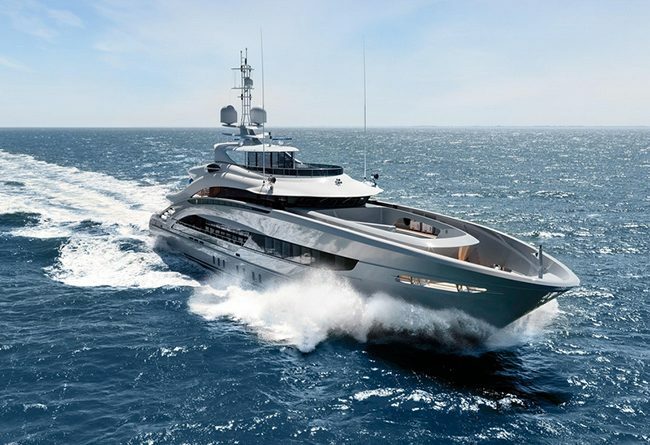 The yacht’s guests will experience VIP comfort, due to its round bilge steel hull with bulbous bow. Plus they will enjoy exceptional sea keeping and unparalleled performance. Soon, Omaha by Heesen Yachts will leave The Netherlands. She begins her maiden voyage to the Mediterranean Sea. Once there, her new owners will finally take ownership firsthand. Design studio Reymond Langton created a luxurious but welcoming interior. The yacht offers accommodations for up to ten guests. There are a totla of five cabins. The Owner’s stateroom can be found on the main deck forward. Lastly, the four large guest suites are located on the lower deck. YN 18850 Project Triton is the sister ship to Omaha. She is currently under construction at the Heesen shipyard in Oss, The Netherlands. When completed, the new yacht will be available for delivery in February 2020. Have you dreamed of owning a super yacht like the new Omaha from Heesen Yachts? Contact us and we can help you make that dream come true. Stop by soon and follow our luxury blog for more luxury yacht, industry news.